Egyptian clashes with police on December 20, 2013. 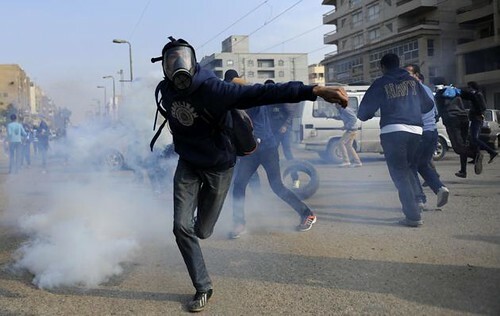 The protesters were opposing the military-backed regime in Cairo., a photo by Pan-African News Wire File Photos on Flickr. The decision of the Egyptian government to declare the Muslim Brotherhood a terrorist organisation on Wednesday has been met with support from government allies. Many pro-government groups have for months demanded the action from the government, accusing the Brotherhood of mounting various terrorist attacks on the government since the ouster of Islamist president Mohamed Morsi on 3 July, including a deadly bomb attack in Mansoura on Tuesday which killed at least 16 people and injured 135. The Brotherhood denied on Tuesday any link to the Mansoura or other terrorist attacks. The Sinai-based jihadist group Ansar Beit Al-Maqadis on Wednesday claimed responsibility for the Mansoura attack. The Rebel (Tamarod) group which had lobbied for the ouster of Brotherhood president Mohamed Morsi, said that labelling the Brotherhood a terrorist organisation was delayed but "better late than never." "We believe that the great Egyptian people will conquer terrorism; the 14 and 15 January will be the greatest evidence on how the Egyptians support the roadmap and revolution's constitution," read a statement on the group's official Facebook page, referring to a referendum to be held on the recently-amended constitution in January. The Egyptian Social Democratic Party also welcomed the decision of the government. "This decision calmed the Egyptian people, especially after the terrorist attacks this group has been doing in the Egyptian street," said the party's head, Mohamed Abul-Ghar, on Al-Hayat TV channel on Wednesday. The liberal Free Egyptians Party issued a statement on Thursday welcoming the "historic decision" that puts an end to "one of the most horrible fascist and racist groups." The Brotherhood has utilised religion as a cover and threatened not only Egypt but also "the modern civil state and human civilisation in general," claimed the statement. The party also called the Egyptian people to participate in the upcoming constitution referendum and the Egyptian government to communicate with the General Assembly of the United Nations and Interpol in order to track down members of the group internationally. Officials of the liberal Wafd Party also welcomed the decision, but echoed the sentiment that it should have been taken earlier. In TV statements on Wednesday Hossam El-Kholy, the secretary-general of the Wafd Party, stated that the Egyptian people rejected the Muslim Brotherhood regardless of any bombings that had taken place or were yet to come. International law expert Ayman Salama said the government's decision to label the Muslim Brotherhood as a terrorist group could not be reviewed by the judiciary, as the decision was a "sovereign decision" taken by the executive power to preserve the safety of the country. He said Article 17 of the judicial powers law stipulated that courts can't look directly or indirectly into "sovereign decisions," because of their highly political nature. Al-Gamaa Al-Islamiya, the ultra-conservative Islamist group, issued a statement Thursday calling the decision of Egypt's interim government declaring the Muslim Brotherhood as a "terrorist group" unfair. The Islamist group, which is a member of the Brotherhood-led National Alliance to Support Legitimacy, said the government's move was especially unwarranted after another group claimed responsibility for the blast that killed 16 in Mansoura Tuesday, reported MENA. The statement of the Islamist Group said that the cabinet decision is "unjust," and warned "it will affect the social, political, economic and security situation of the country." Al-Gamaa Al-Islamiya is one of the Islamist groups that re-emerged as a prominent player on the Egyptian political scene since Hosni Mubarak was ousted from power in February 2011 and after its prominent leaders, Aboud and Tarek El-Zomor, were released. The Zomor cousins were sentenced to life inprisonment for their role in the assassination of President Anwar Sadat in 1981. Meanwhile, human rights lawyer Malek Adly told Ahram Online the decision " is problematic. This is an administrative decision and not a legislative one, as only the interim president has a legislative right to issue decisions and laws, not the cabinet,"
"I highly doubt that those who took the decision thought about its legal basis thoroughly; it was a political decision not a legal one," Adly added. "It would have been better to wait for the court to issue a verdict to categorise the Muslim Brotherhood as a terrorist organisation." Salah Abdel-Maboud, a leading member of the Salafist Nour Party, has said that the decision of the government to declare the Brotherhood a terrorist group needed more time for deliberation. "The country is unstable and any decision to exclude a political faction in the current stage can lead to bad reactions," Abdel-Maboud told Al-Ahram's Arabic website on Wednesday. The Nour Party were at one time key allies of Morsi and the Brotherhood, although the group decided to support his ouster and have since backed interim authorities and their transitional roadmap. Abdel-Maboud added that designating the Brotherhood a terrorist group would take the group underground once more, and that it was better to have a dialogue with the Brotherhood rather than excluding them from political life.